Shop review #21 – I’ve already posted several reviews of the restaurants we went to in Brighton during our mini break there this Summer (there are still some more to come!). 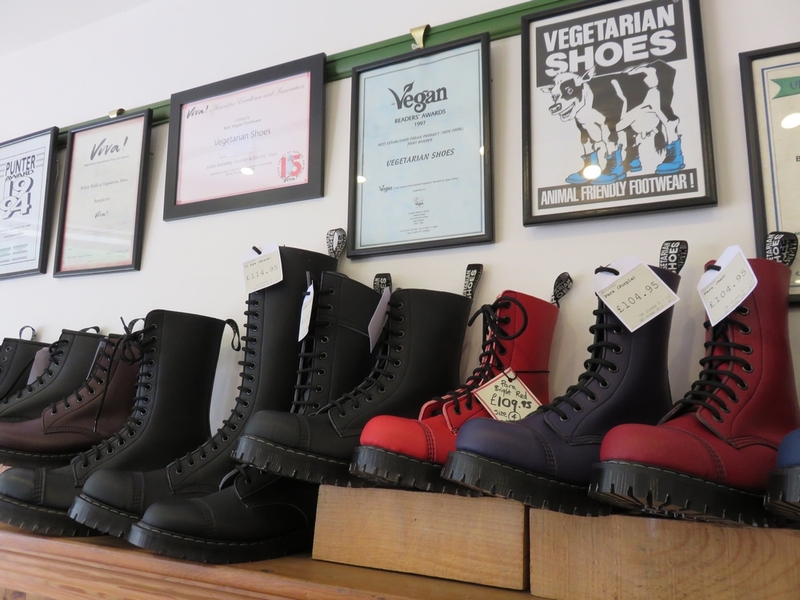 Brighton not only has a large collection of vegan eateries and restaurants with vegan options. 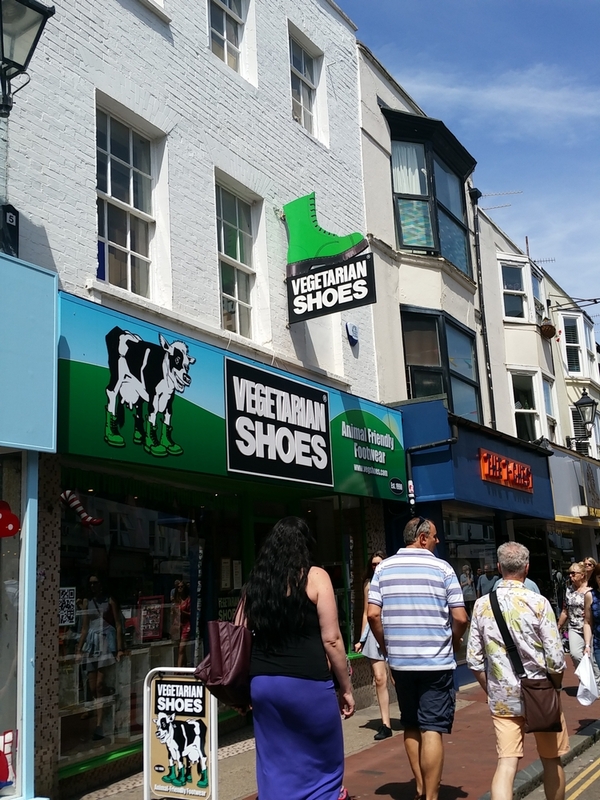 There is also a shop of the well-know brand ‘Vegetarian Shoes’. It’s located in Gardner street, which is in the main shopping area of the city. And it is right across from a Loving Hut restaurant (world wide vegan restaurant chain). We were there on a Saturday, and the street was made into a pedestrain zone, with terraces in front of cafés and pubs. The weather was beautiful, so it was a nice atmosphere! 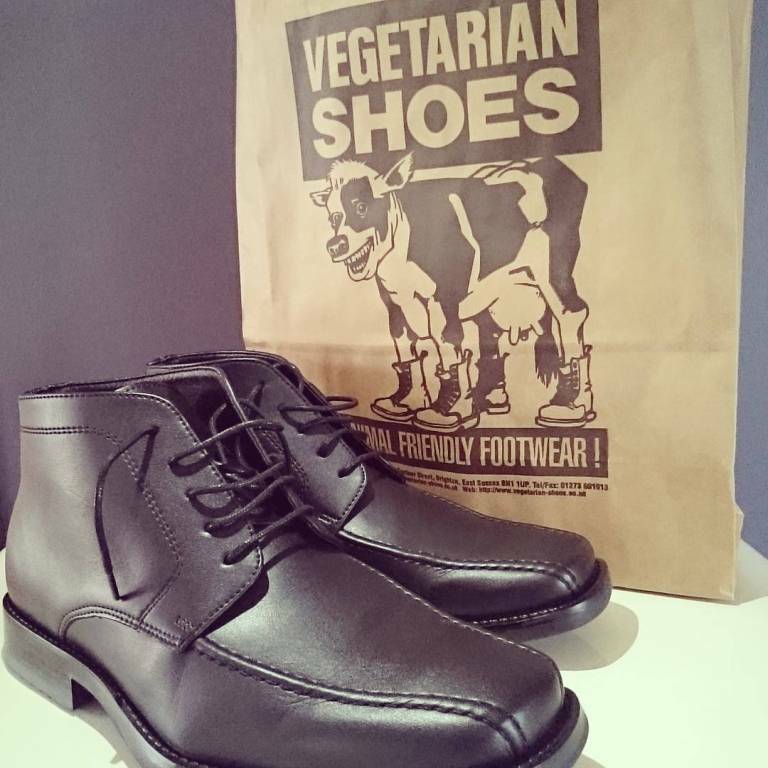 Although you can nowadays easily find vegan shoes online, I do find it difficult to buy shoes online, as I definitely want to fit and ‘feel’ them (out of 5 shoes I try, most of the times only one ends up being comfortable!). So I was eager to go to a ‘real life’ vegan shoe shop, where I could actually fit the shoes!I I had already bought a wallet from the brand Vegetarian Shoes, through a French webshop (together with two Matt & Natt bags, see my blogpost about that here), and it is a well know brand for vegan shoes. 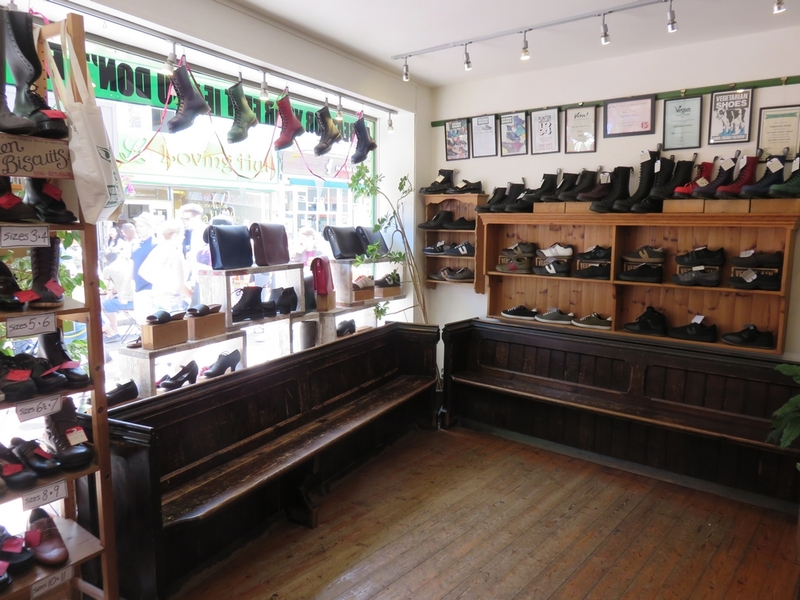 The shop in Brighton is spacious and has a reasonable collection of shoes. I wanted to try out some of the boots, but as it was the middle of Summer, I was not wearing socks, and there were no socks available in the shop for fitting (there were only some very thin nylons – I don’t know whether this is typical British, but in Belgian shoe shops, there are normally always socks available for fitting). 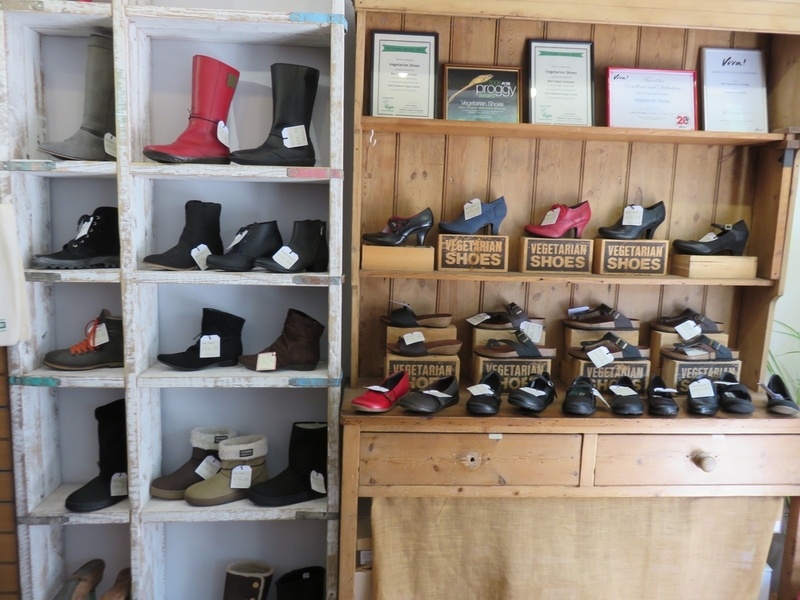 We did buy these skyline boots for Jim, which are classy and comfortable (£79; roughly 120€). 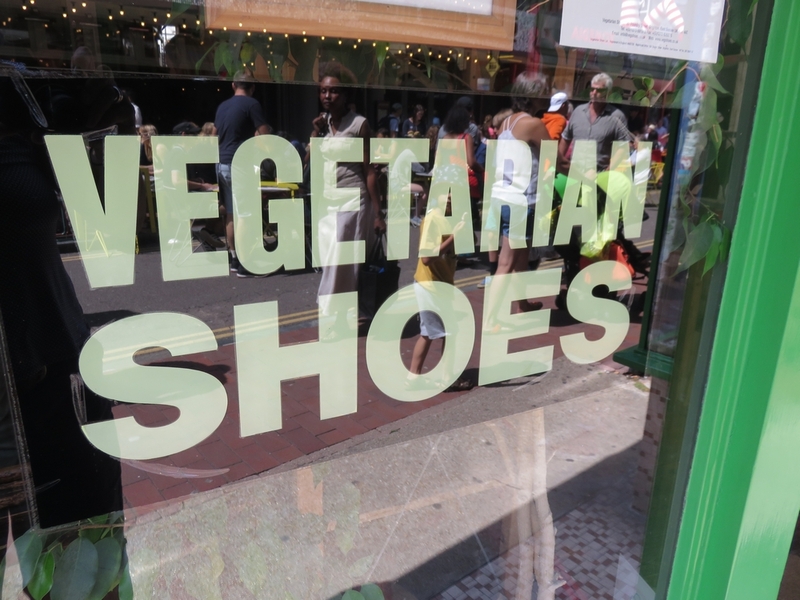 I was in the Vegetarian Shoe store about 20 years ago. I’d love to go there again. Thanks for the review. Can you tell from the photos whether the shop has changed much since you were there? Brighton is a great place for a mini break. I’ve wanted a pair of their boating shoes for ages. Will to pick up a pair in the summer. Good to know I won’t need socks to try on shoes in your part of the world. Yes, we really enjoyed our stay in Brighton! 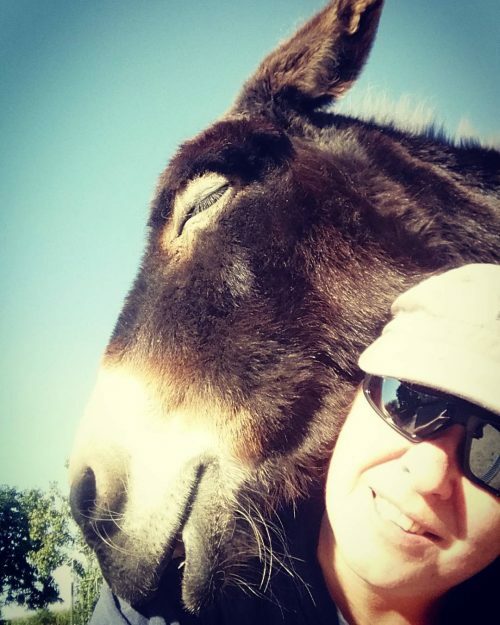 Thanks for stopping by on our blog!